You can use Systems Manager Resource Data Sync to send compliance data from all of your managed instances to a target Amazon S3 bucket. When you create the sync, you can specify managed instances from multiple AWS accounts, AWS Regions, and your on-premises hybrid environment. Resource Data Sync then automatically updates the centralized data when new compliance data is collected. 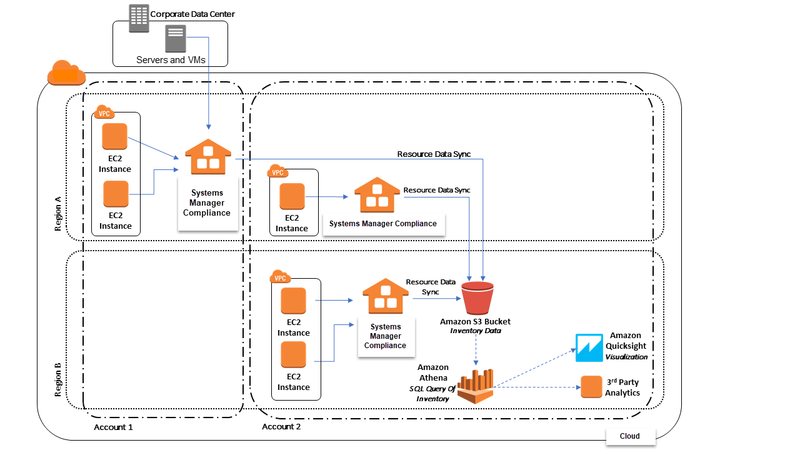 With all compliance data stored in a target Amazon S3 bucket, you can use services like Amazon Athena and Amazon QuickSight to query and analyze the aggregated data. Configuring Resource Data Sync for configuration compliance is a one-time operation. The following graphic shows how Resource Data Sync aggregates all data from different accounts, Regions, and your hybrid environment to a central repository. Use the following procedure to create a Resource Data Sync for Configuration Compliance by using the Amazon EC2 console. Create a bucket to store your aggregated Inventory data. For more information, see Create a Bucket in the Amazon Simple Storage Service Getting Started Guide. Make a note of the bucket name and the AWS Region where you created it. Choose the Permissions tab, and then choose Bucket Policy. Copy and paste the following bucket policy into the policy editor. Replace Bucket-Name and Account-ID with the name of the Amazon S3 bucket you created and a valid AWS account ID. Optionally, replace Bucket-Prefix with the name of an Amazon S3 prefix (subdirectory). If you didn't create a prefix, remove Bucket-Prefix/ from the ARN in the policy. In the navigation pane, choose Managed Instances. If the AWS Systems Manager home page opens first, choose the menu icon ( ) to open the navigation pane, and then choose Managed Instances. Choose Resource Data Syncs, and then choose Create resource data sync. In the Sync name field, type a name for the sync configuration. In the Bucket name field, type the name of the Amazon S3 bucket you created at the start of this procedure. (Optional) In the Bucket prefix field, type the name of an Amazon S3 bucket prefix (subdirectory). In the Bucket region field, choose This region if the Amazon S3 bucket you created is located in the current AWS Region. If the bucket is located in a different AWS Region, choose Another region, and type the name of the Region. If the sync and the target Amazon S3 bucket are located in different regions, you may be subject to data transfer pricing. For more information, see Amazon S3 Pricing.